Snow Peak Tableware Set (L Family). 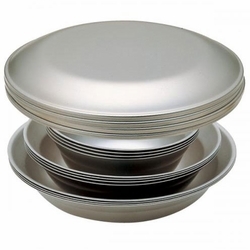 Light weight stainless steel tableware set comes with four of each of the four different sizes of dishes that can be stacked in one piece. 0.4mm thick stainless steel is utilized to produce thin, lightweight, tough, and rust free dishes. You will love this compact set. Dimensions: D 8.3" H 3"
Size Stowed: D 8.3" H 3"